A steady line formed Sunday inside our Phoenix Dining Room, as more than 200 guests eagerly awaited for their turn to sit on a barber's chair and receive a haircut. 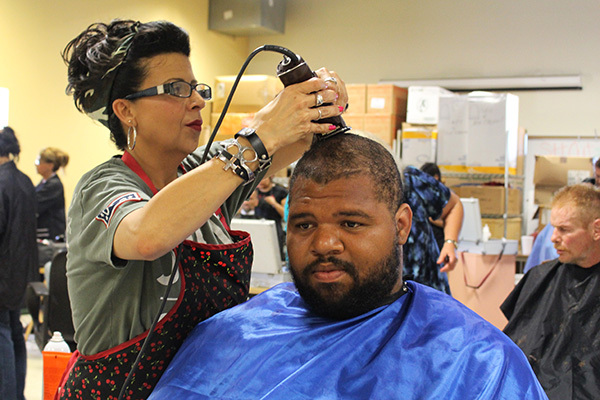 Professional barbers and stylists, as well as some students, volunteer their time four times a year during St. Vincent de Paul's Hair-Cut-a-Thon. The event, now in its 22nd year, helps restore the guests' dignity and self-image. "The mission of the event is simple, we want our guests to feel good about themselves," said Jerry Castro, manager of the dining room. "Guests get their hair shampooed, their beards trimmed, a good haircut and a hygiene kit to take with them." The event in June is particularly important as guests gear up to survive in Phoenix during the summer months' grueling heat. A neat haircut can definitely help with that, and most guests look forward to it. "Everybody was so grateful," Jerry said. "Some guests have even gotten to know the barbers, who have been volunteering for so many years now. It truly is a community effort." As he was sitting in the chair, in the middle of his makeover, a guest told the barber he had changed his mind and would rather get rid of his moustache. He wanted it all gone, he said, so he would feel fresh for longer. Once the barber had finished, and he looked at himself in the mirror, the guest couldn't help but smile and say thank you.